We offer a full line of void fill to secure and cushion a wide range of products in virtually all commercial and industrial applications. Our void fill protects products from shock damage in transit by filling voids and absorbing impacts. While most of the products are interchangeable for most applications, specific products are especially well suited for certain uses. Polystyrene “Peanuts” are made of pieces of flowable polystyrene interlocking material. They hold a product suspended and safely protected from many types of shocks. This expanded polystyrene material can be used for a wide range of products, from delicate glassware to industrial fuel injectors. “Peanuts” are efficient to use and are most suitable for fast, production-like environments. 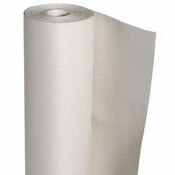 Bogus paper is used as interior void fill in packing in shipping operations. The material provides high bulk, low density and excellent flexibility. In particular, it is very soft for objects that require surface protection and has high absorbency for protection against dampness. Newsprint is the paper our newspapers are printed on without the print. When crumpled and stuffed into the spaces between items or walls of boxes, newsprint cushions one item from another inside a package and from shocks and objects outside the package. Polystyrene “Peanuts” are very convenient and fill spaces rapidly because they flow easily around and under fragile products or articles. They work best when the product or article is suspended with a space of about three inches on all sides. Bogus paper is inexpensive and easy to tear and shape around products and articles. It is soft and easy on the hands of packers. It is also thick enough that it has a memory and tries to regain to its original shape, so that it absorbs the shocks generated by the shipping process. Clean, relatively inexpensive and thinner than bogus paper, newsprint is used for stuffing, wrapping and filling voids. You have to be very careful to use the appropriate material for the products or articles you are packing. “Peanuts” are most effective when the shipping container is slightly overfilled, which causes the product or article to be locked in place. Because of their shape, the “Peanuts” lock themselves together, thus holding the product or article suspended. Newsprint does not adequately protect very delicate items, like fine china, but it can be used for books and other written materials and sturdy glassware like bottles. Bogus paper should not be used where dust particles are undesirable. 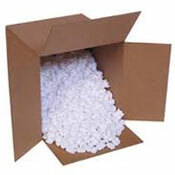 Polystyrene “Peanuts” are available in 14 cubic-foot bags. 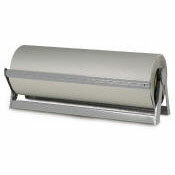 Bogus paper comes in 24-inch and 36-inch rolls. Newsprint is available in sheets of several sizes – 18 inches by 24 inches, 24 inches by 36 inches, 50-lb. bundles and rolls of 24 inches and 36 inches. The density of the polystyrene material used for “Peanuts” is about 2.3 to 2.4 lbs. per cubic foot. Bogus paper is 50 lb. base weight, and newsprint is 35 lb. base weight. Both these paper products and polystyrene peanuts are made with recycled and recyclable materials, and they do not contain CFCs (chlorinated fluorocarbons). Bogus paper is manufactured from 100% post consumer waste.